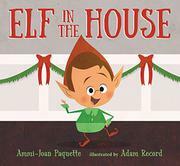 A little girl hears strange sounds on Christmas Eve, leading to encounters with a mouse, an elf, a reindeer, and Santa himself. The unnamed girl seems isolated and lonely on Christmas Eve, creeping downstairs by herself. She hears a squeak and finds a smiling mouse, and they then hear a giggle and find an elf. The trio hears a “CLIP-CLOP!” and meets a red-nosed reindeer. They all move on to the Christmas tree, hearing a “Ho, Ho, HO!” and finding Santa. After sharing cookies with Santa, the girl and her new mouse friend settle down to wait for Christmas morning. The girl and the elf are white; Santa has light brown skin. The simple story tells of a “jolly Christmas Eve” with “joy gleaming bright,” but both the text and the illustrations fail to create a sense of anticipation or excitement. Computer-generated illustrations use a muted palette of green, lavender, and purple that conveys a subdued atmosphere rather than one of joyful celebration, and the cartoon-style characters lack a sense of motion. A few of the text blocks are set in black type on dark walls and are nearly unreadable. The title and cover are also misleading, as they imply the story is about a seemingly male elf, when it really is about a lonely little girl meeting new companions on Christmas Eve who cheer her up.